The name Lovers Leap conjures up romantic and perhaps tragic associations. Once a popular spot with Victorian couples, it is less visited now and it is true that the years have rolled by without anyone paying much attention to the condition of this secluded beauty spot located just outside Buxton. Even so, members of Buxton Civic Association where stunned by the tide of rubbish they encountered when they surveyed the site earlier this year. Both the gorge itself and the slopes above the western cliff-face were strewn not only with bottles and cans but also bits of car bodywork, dumped kitchen appliances and building materials. 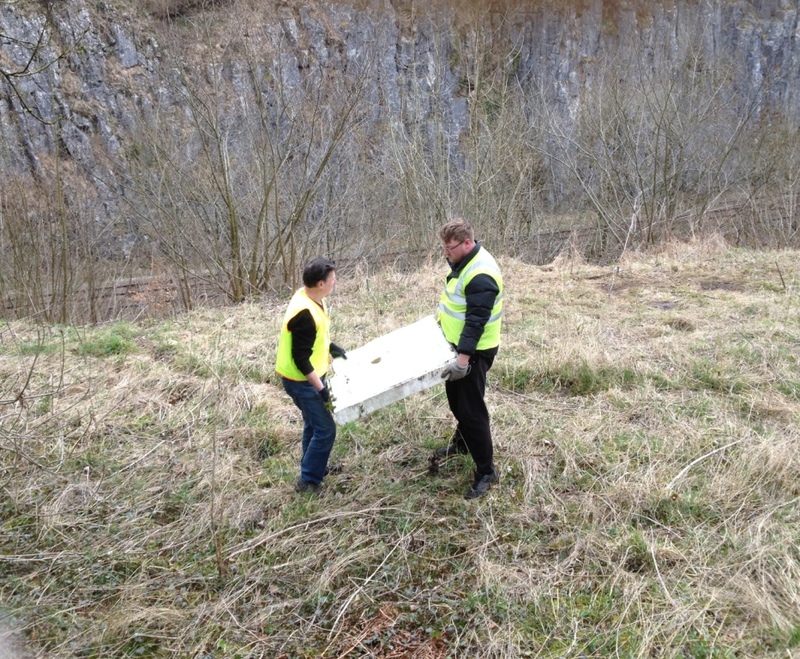 On 1 April, a small team of BCA members began the clean-up of the partially terraced slopes above the western cliffs. BCA Business Development Manager, Simon Fussell asked team leader, Roger Floyd, on site, what the team had found there. He replied that, clearly, for a long while, pedestrians on Dukes Drive and people in passing vehicles had been throwing bottles, cans, fast-food containers and other litter over the boundary wall onto the site. But that was far from the whole story. “Parking here is awkward and access to the site if you are carrying large or heavy items is difficult”, he continued. 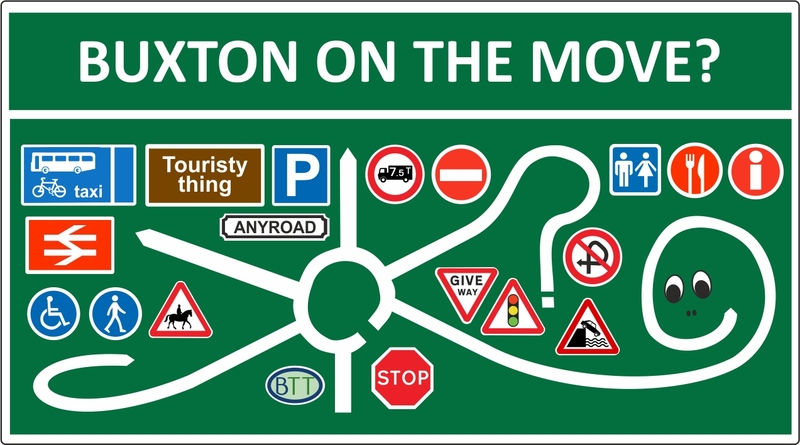 “Buxton has an easy-to-reach, convenient-to-use, recycling centre where anyone can dispose of reasonable amounts of any kind of waste. And yet, inexplicably, some people seem to have actually chosen to dump items on this beauty spot rather than at the recycling centre. “For example”, he added, pointing to a curious rectangular object near our feet, “this 60 kg concrete shower base”. Earlier in the day, two of the team had found three abandoned tents on the site. One was full of old clothes. The other two were fully equipped with cooking gear and bedding. Everything was in an advanced state of decay but clearly, at some time in the not to distant past, more than one person had been living there and for an extended period. Our team were certain that was an ‘extended period’ because amongst the other detritus were 16 two-litre bottles all filled with a yellow fluid. Alas, hopes that it was a collection of rare vintage French wines were soon dashed when one of the bottles was opened. One of our campers had been collecting his own urine. Why? We shall never know. But he certainly didn’t amass his stockpile overnight. In the end the bottles were left in the tent where they were found. 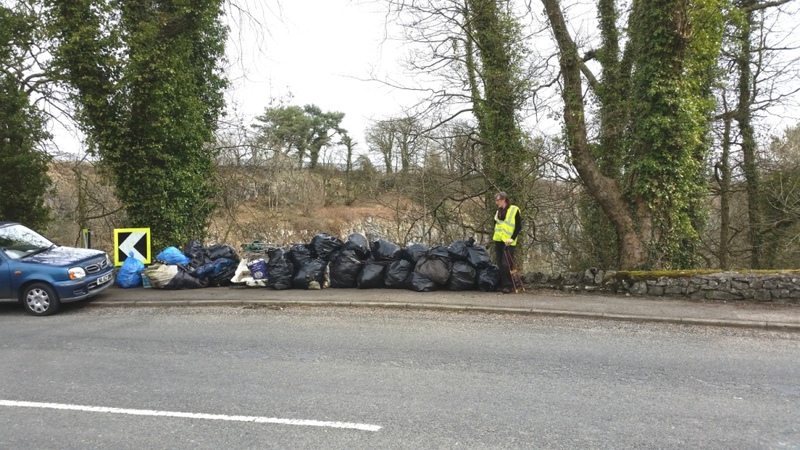 The tents were then bundled up and left on Dukes Drive with the 25 sacks of litter, the shower base and other debris that the team had gathered from the site. To its great credit, the Borough’s Street Care and Cleaning Service sent a truck immediately to pick it all up, even though it was now late on Friday afternoon. We expect that another three clean-ups will be necessary to clear the whole site. Anyone for a glass of Chardonnay?